OWEN Jenkins ended a long and tense day in Wiltshire with the Cuestars Under-21 Bronze Tour rankings title within his grasp. 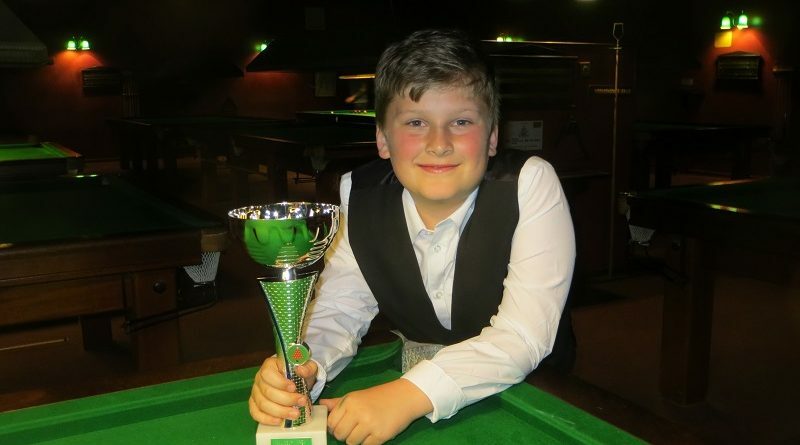 The ten-year-old from Havant defeated his Waterlooville Sports Bar clubmate Thomas Sharp 2-0 in the final of the penultimate leg. It means Jenkins takes a 21-point lead over second-placed Sharp into the last event at Chandlers Ford Snooker Club on Sunday, May 5. Summing up the ten-hour day at Salisbury Snooker Club, he said: “It was nerve-wracking but good. I was happy with how I played. Jenkins edged home player Eddie Mason on the final black in his first group-stage match. But he stepped up a gear and laid claim to the Bronze Tour’s highest break of the season with a 49 in his next game against Warminster’s Thomas McEvoy. Following a victory over Swindon youngster Taylor Elliott, Jenkins beat another home player Will Kempson 2-1 from 1-0 down in the last-eight and clubmate George Laxton 2-0 in the semis. Paying tribute to his knockout opponents, he said: “It was probably one of the hardest quarter-finals I’ve ever played because Will was potting balls from everywhere. And did he ever think he had Sharp beaten? Renowned YouTuber ‘SharpMeister’ Sharp had overcome third-placed Dylan Smith, from Tunbridge Wells, 2-1 from 1-0 down in his last-four match. Laxton had his best ever run in his debut season in the event sponsored by TopCue. He came through a three-way play-off and beat Andover’s Freddie Turner 2-1 in the last-eight. Visit snooker products supplier TopCue on the Downton Industrial Estate or at www.topcue.co.uk. ROUND-ROBIN GROUP A: 1st, Owen Jenkins (Waterlooville Sports Bar); 2nd, Thomas McEvoy (Salisbury SC); 3rd, Taylor Elliott (147, Swindon); 4th, Eddie Mason (Salisbury SC). ROUND-ROBIN GROUP B: 1st, Thomas Sharp (Waterlooville Sports Bar); 2nd, George Laxton (Waterlooville Sports Bar); joint 3rd, Katie Griffin (Jesters, Swindon) & Bradley Brewer (Salisbury SC). ROUND-ROBIN GROUP C: 1st, Dylan Smith (Victoria SC, Tunbridge Wells); 2nd, Will Kempson (Salisbury SC); 3rd, Jaydon Elliott (147, Swindon); 4th, Kostas Ormerod (Chandlers Ford SC). ROUND-ROBIN GROUP D: 1st, Freddie Turner (Salisbury SC); 2nd, Harry Wyatt (Chandlers Ford SC); joint 3rd, Tyler Mack (Waterlooville Sports Bar), Ryan Kneller (Waterlooville Sports Bar) & Ryan Wilson (Waterlooville Sports Bar). QUARTER-FINALS (12 points): Jenkins 2-1 Kempson, Laxton 2-1 Turner, Sharp 2-0 Wyatt, Smith 2-0 McEvoy. SEMI-FINALS (15 points): Jenkins 2-0 Laxton, Sharp 2-1 Smith. FINAL (25/18 points): Jenkins 2-0 Sharp.